Today, the entire world is connected via internet in some way or the other. So, you cannot afford to ignore its impact and effects on businesses. Due to its ubiquity, marketing via internet i.e., internet marketing is now much cost-effective, easier and all-embracing. Also called online marketing, internet marketing means endorsing your products, services, or brand as a whole using various online tools and platforms with the aim of building brand awareness or driving traffic, leads or sales. Internet Marketing is a broad term encompassing a collection of marketing tactics and strategies performed via a website, social media, search engines, email, etc. Every internet marketing campaign is different based on goal, target audience, business type or budget. Nothing is more important for advertisers than reaching a vast target audience at ease. Internet marketing allows you to reach far beyond your local reach and to market your products and services globally which conventional marketing doesn’t. You get access to millions of online clients worldwide even after your business hours. Thus, your business is visible 24/7 to the online audience. Brand awareness and engagement is of utmost importance for businesses. To stay and thrive in this competitive market, your brand must stand out. Internet marketing works on the basis of varied content like a blog, video, ad, infographic, etc. that keeps the visitors engaged. You can use Call-to-Actions to attract the visitors to take the desired action on your content. Marketing your business online is far cheaper than doing it offline. Some online marketing techniques like blog promotion, basic SEO, Google My Business listing, etc. are even free of cost. While advertising in newspapers, radio, and TV cost you much, online marketing ensures that you pay only for when people engage or take some action on your ad. Online marketing campaigns can make each part of your business more automated. You can keep a track of who visited your website, who clicked on your ad, who are the returning visitors, etc. easily. With varied online tools, you can measure and track the performance of your marketing campaign. One of the main benefits of internet marketing is that you can select your target audience to the minutest details like demography, gender, age, device, etc. unlike traditional marketing where you just hope that your promotions reach the relevant audience. The best part is that you don’t have to micromanage the online campaigns as everything is well-automated and done in a targeted manner. 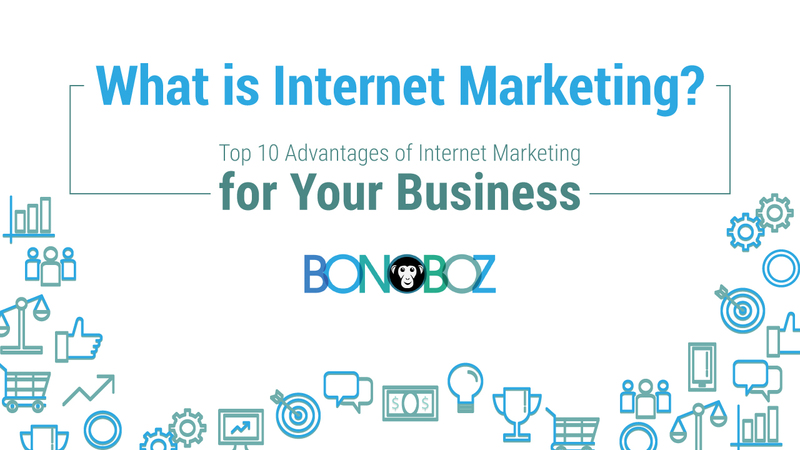 Internet marketing is not a one-time process neither are its results. You can keep continuing your online marketing campaign till your budget lasts or schedule it for a specific timeline. Nonetheless, the content generated on your website will stay effective even after the campaign is over. The lingering effect of the online campaign can generate leads over a long period of time. As you can measure the campaign performance, you can plan the next steps to be taken. You can easily collect the email addresses and other details of the prospects. With these details, you can design an email campaign or a remarketing campaign to lead the interested ones to the deal closure. Online campaigns also help in improving the after-sales relationships with your existing clients. Online marketing allows you to not only measure but also optimize the campaigns. Fine-tuning the online campaign is much easier than the traditional one. You don’t have to stop the entire campaign for making the changes. You can optimize the campaign by tweaking the budget, target audience, runtime, and much more. Customer experience is of utmost importance. No one would like to see the ads that are not relevant to their interests. Personalization is possible in online marketing campaign based on the specific interests of the clients derived from their purchase history, cookies, pages visited, etc. Online surveys are also one of the methods to personalize the customer experience. Various strategies of online marketing like SEO, Social Media Marketing, Email Marketing, Search Engine Marketing, and Content Marketing can be used simultaneously based on your budget and marketing goal. The diversified strategy of marketing online makes it easier for you to reach your target audience wherever they are. It has become inevitable to be present online to let the world know about your business. So, if you’re looking for better ways to reach your audience, online marketing is the key. Start with any one method and add more tactics as and when needed. Next Next post: What are SEO Backlinks? How Does it Help to Get Higher Rank in SERP?